I’m a bit bummed that Teavana is closing its locations across Canada (and from the rumblings on the internet, I believe the US locations may be closing soon as well), but that didn’t stop me from stopping into a local Teavana location to see what they still had in store. As far as I can tell, they don’t even have a Canadian website anymore and the US website does not deliver to Canadian addresses (whomp, whomp). Anyways, I digress. I saw this one up on the shelf still and was intrigued. 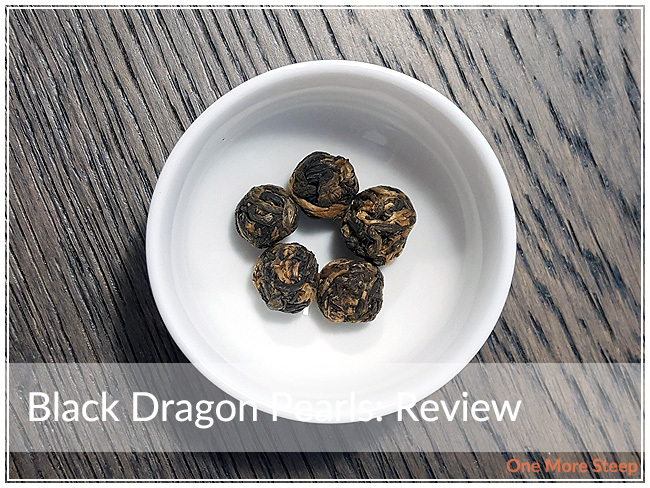 Black Dragon Pearl is a straight black tea. 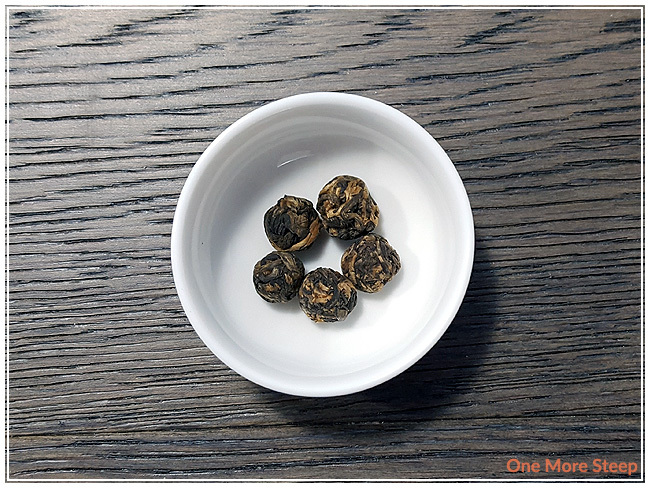 As per the Teavana website, it says that the pearls each consist of 30 leaves tightly rolled together. I didn’t count them, so I’ll pretend that the number 30 is factually accurate. The product page also suggests that there are cocoa undertones to this tea, which I do not smell at all. The overall aroma from the pearls is an earthiness. Teavana recommends steeping Black Dragon Pearl in 196°F (91°C)water for 3 minutes. I steeped 3 pearls in my teapot for 3 minutes. Black Dragon Pearl steeps to a beautiful golden orange for the first steep. The aroma that comes up from this tea has primarily earthiness, with a touch of malty aroma and a tiny bit of honeyed sweetness. Thankfully, the tea also had the same flavours that the aroma hinted at. 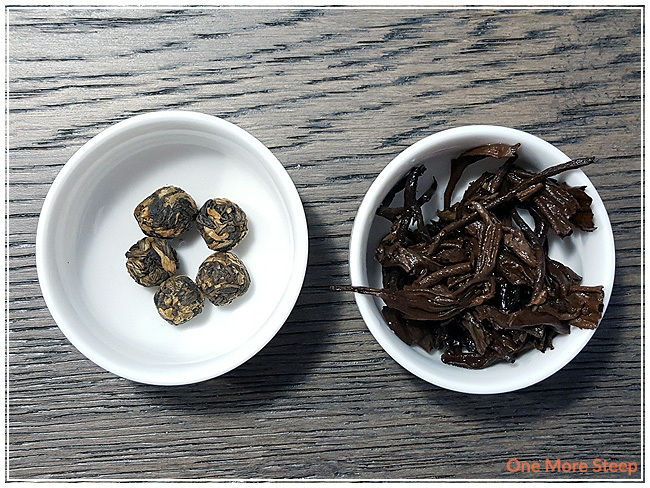 There was earthiness in the flavours that went well with the maltiness that is familiar with black teas. The sips I had of this finished off with a touch of honey and a hint of floral sweetness. 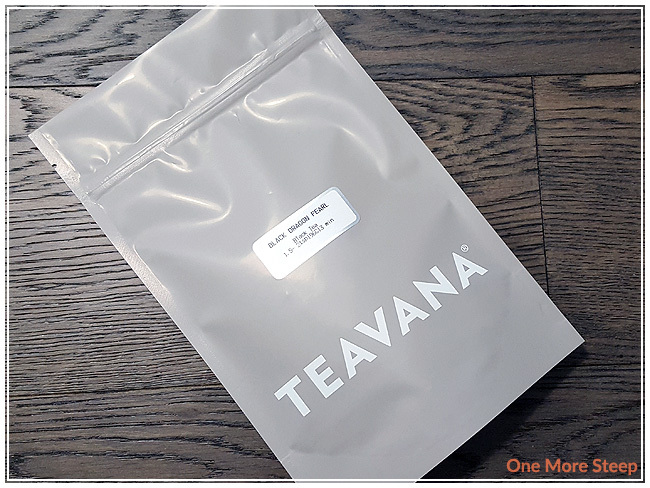 The sales associate at Teavana suggested that the Black Dragon Pearl could be steeped upwards of 3 times, which of course meant that I had to attempt at least an steep (which meant that I did a full 3 resteeps, for a total of 4 steeps of the same leaves). 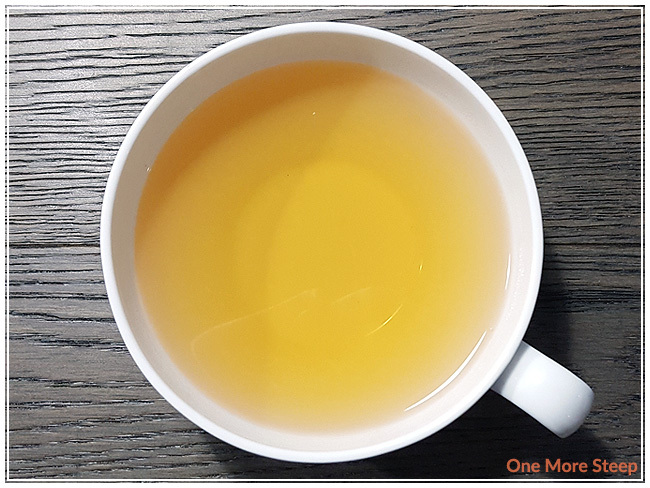 I increased the steeping time by 30 seconds per steep and found that the colouring of the tea was significantly lighter for the first resteep. The floral and honey notes in this tea were more forward in the resteeps than in the initial steep. I still didn’t find any chocolate/cocoa notes in this tea in any of the steeps. I loved Teavana’s Black Dragon Pearl. I really wish I didn’t love this one because the store is closing, which means I’ll need to get my hands on just a little bit more to keep myself happy until I find another source for a good black pearl tea. The flavours of this tea are delightful, and I love how well it resteeps with the increasing honey and floral flavours. Plus, the big bonus is being able to watch these tea leaves open up – I just love pearl teas.